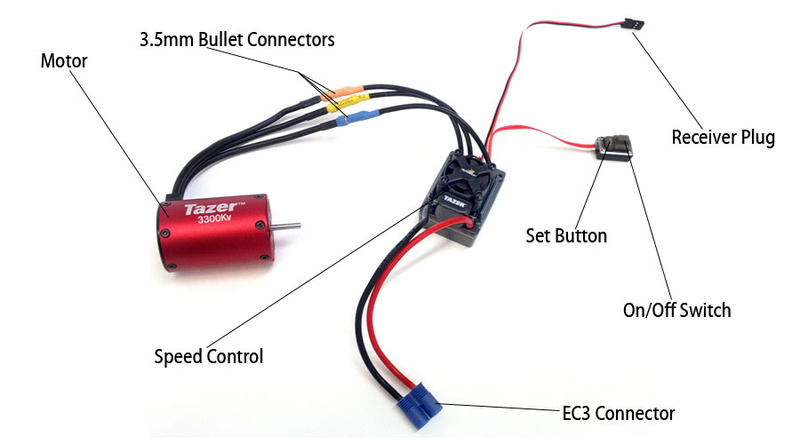 The Dynamite Tazer Brushless System is an affordable way to outfit your radio control car or truck with a modern brushless motor and speed control. The Tazer system also offers more programming options than similar offerings like the Traxxas Velineon system. However, while other brands have computer programs to assist in programming their speed controls (i.e. 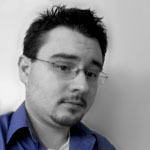 Castle Creations), the Dynamite programming method is a bit more complicated. The manual outlines how to program the speed control, but it doesn't do a good job of explaining it in a way that anyone can understand. This guide is designed to be an aid to those who have read the manual and still struggle with the programming procedure. This guide assumes you have completed the installation of the motor and speed control onto your vehicle and have it hooked up properly to the radio system. First, we need to know what parts of the speed control are what. The diagram below shows where everything is. To get the most out of your speed control, it needs to know what the radio's signal is for neutral, full throttle, and full brake/reverse. For the speed control to know this, we must teach it these signals through the calibration process. Here's how to do it. We're starting with the battery unplugged and every thing off. Turn on your transmitter. Make sure the throttle is not reversed on the transmitter, the throttle trim is at zero/neutral, and the throttle travel is at 100%. Also disable any special functions your transmitter can do (i.e. ABS). Plug your fully charged battery into the speed control. Hold down the "Set" button and turn on the speed control at the same time. Release the button as soon as the Green LED in the speed control's casing starts to flash (the image to the right shows where the LED is located). Ensure the throttle is at neutral. If it is, press the "Set" button. The green LED will flash once. Now pull the trigger for full throttle. Press the "Set" button again. The green LED will flash twice. Finally, push the throttle forward into full brake/reverse. Press the "Set" button once more. The green LED will flash three times. Once this process has completed, the motor will start working again after 3 seconds. Now your speed control can reach its full potential! There are a variety of parameters you can program into the speed control. You can disable reverse, change how much drag brake the motor has, adjust the cut-off voltage and more. Here's a complete list of programming options with descriptions of each. Most racetracks have rules requiring reverse to be disabled during the race. This helps prevent crashes and broken cars during the event. Enabling this option will completely remove reverse, leaving you with only brakes. Most backyard bashers and non-racing R/C enthusiasts won't choose this option. This is the basic way most people expect the speed control to operate. It has what is called a "Reverse Lockout" that ensures you can't be going forward and immediately kick it into reverse. That's bad for the drivetrain. If you'd like to use reverse, the car has to be at a complete stop. If it's traveling forward, the brakes will slow the car to a stop. Release the trigger and hit reverse again, and it will begin traveling backwards. There is no pause from reverse to forward, however, so it's possible to damage the drivetrain with a sudden change to forward while the car is traveling in reverse. Drag Brake is a brake that is applied when the car is in neutral. It will slow the car down while coasting, just like a full scale car has a braking effect from an engine. The Low Voltage Cutoff (or LVC) is designed to prevent the battery from over-discharging. This is mainly designed for Lithium Polymer (LiPo) batteries. You can read more about LiPo batteries in our Guide to LiPo Batteries article. If you're using Nickel-Metal Hydride (NiMH) or Nickel Cadmium (NiCd) batteries, I prefer to have the LVC off (Option 1). If you are using LiPo batteries, I would use either Option 5 or Option 6. Options 2-4 are too low for me to feel comfortable using them with LiPo batteries, and they cut off too soon for NiMH or NiCd batteries. Otherwise known as your "Punch" setting. This controls the "punch" of the vehicle under its initial acceleration. Level 1 offers a very soft start, while Level 4 is a much stronger acceleration. Turning the setting down will help to ease the strain on the drive train, but the vehicle will be less likely to do wheelies. Turning it up will have the opposite effect. This setting adjusts the amount of braking you have when at full brake (represented by percentage). A higher braking percentage is stronger, but will lock the tires - this will make you lose traction, and will likely cause the rear end of the truck to swing out, much like sliding on ice while driving in the winter. A setting with this yellow background is the factory default setting. Turn on the transmitter. We don't need it to program the speed control, but it has to be on for the speed control to work. Make sure the throttle trim is at neutral. Plug a fully charged battery into the speed control and turn it on. Hold down the "Set" button for 1 second until the green LED inside the speed control's case blinks. Once it blinks, release the "Set" button. Press and release the "Set" button to switch from one menu option to the next. The green LED blinks will correspond to the current menu option (i.e. it will blink once for Running Mode, twice for Drag Brake Force, etc). When you get to the desired menu option, press and hold the "Set" button for 3 seconds until the green LED blinks rapidly for a short time, indicating you have moved to the next step. As with the main menu items, press and release the "Set" button to move among the options within the menu. The green LED will blink to correspond with the option number, just as it did in Step 4. Once you arrive at your desired setting option, hold down the "Set" button for 3 seconds. This will save the setting. Power off the speed control. If you desire to to change another setting, repeat this procedure for each setting. To reset the speed control to factory settings, simply power up the speed control, then press and hold the "Set" button for 5 seconds. Now you should have your Tazer Brushless system ready to rock and roll. Be sure to check with your local hobby shop for further questions, or call up Horizon Hobby if you don't have a hobby shop nearby. Now go have fun with your brushless power!